Marie Antoinette was one of the, if not the, most glamorous and stylish women of her time. She dictated fashions, and, although she preferred simpler styles, she was famous for her extravagant tastes, her opulent gowns and her crazy hairdos. All heads turned to look at the graceful Queen wherever she went, with women taking note of what she was wearing, so that they could rush to their dressmakers and order gowns and accessories in the same, exact styles. 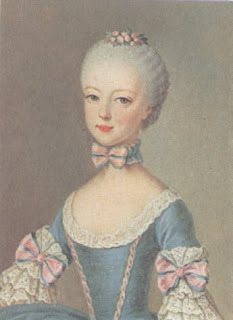 But Marie Antoinette wasn’t always a fashion icon. When, at the tender age of 13, she had been betrothed to the Dauphin, she hadn’t been deemed neither pretty nor glamorous enough to be a suitable French Queen. Ouch! 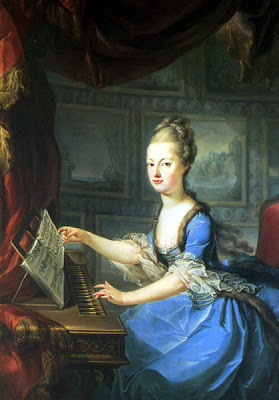 Fashion was very important at the glittering court of Versailles, but the young archduchess wasn’t really interested in it at the time, preferring to play around one of the imperial palaces, and as a result, she often looked unkempt. Something needed to be done to transform this lively caterpillar into a graceful butterfly. To start with, Marie Antoinette needed a whole new wardrobe, and her mother, the empress Maria Theresa, ordered one for her from Parisian dressmakers. This meant that the young girl had to spend hours with dressmakers, milliners and shoemakers, who took her measures, and showed her their new designs and swatches of cloth in every possible fabric, colour, and pattern, so that she could choose those she liked and suited her colouring better. If this could have been fun, at least for someone into fashion, wearing a stiff and restrictive whalebone corset wasn’t. That wasn’t the only torture she had to endure to become a beautiful butterfly. Marie Antoinette’s teeth were crooked, so Pierre Laveran, a French dentist, was summoned to Vienna to fix them. He told the young girl that, for the next three months, she would have to wear the “pelican”, a type of braces made of metal, usually gold, and silk thread, which had been invented by another French dentist, Pierre Fauchard. Marie Antoinette also had a high forehead and an uneven hairline. French hairdresser Larsenneur was called to the rescue. He carefully arranged her thick, strawberry blonde curls in a powdered hairdo that managed to hide both these flaws. Once all these French experts had done with her, Marie Antoinette would have probably stared in awe at the mirror, hardly recognizing the beautiful, elegant and graceful girl staring back at her. Of course, her education and etiquette knowledge needed to be improved too, but that’s a topic for another post.